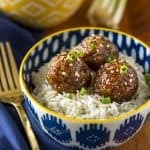 With only 6 ingredients, these Asian meatballs are easy to make and a total crowd pleaser… Finished in the slow cooker, they perform double duty as a game day appetizer or as an easy weeknight dinner when served over coconut milk rice! In case I haven’t made it abundantly clear, I am a sucker for all things sweet & spicy. Cases in point: sweet & spicy quick pickled veggies, sweet & spicy bacon wrapped dates, sweet & spicy bacon wrapped corn… Should I go on? So when I tasted these sweet & spicy Asian maple sausage meatballs at a luncheon hosted by the Ohio Pork Council last week, I knew one thing for certain — I was NOT leaving without the recipe! Luckily, they presented us with printed recipe cards for all of the dishes they served, clipped together with the freaking CUTEST EVER pig paperclip. Seriously, I just can’t even! The Ohio Pork Council also generously sent us on our way with an insulated tote full of Bob Evans roll sausage, so I swung by Kroger on my home to pick up a jar of Thai chili garlic sauce (the only ingredient I didn’t already have on hand). Incidentally, you can find this ingredient in the International aisle, and it’s great for adding a spicy kick to just about any meal. I was super happy to note that it does not need to be refrigerated, because my fridge is currently at it’s maximum condiment capacity. Easy to make — the maple sausage meatballs contain only four ingredients: Bob Evans maple roll sausage, an egg, panko bread crumbs, and maple syrup. The sauce contains an additional two, the Thai chili garlic sauce I mentioned earlier and soy sauce, plus more maple syrup. Finished in your slow cooker — while the meatballs do need to be baked, you finish them off with the sauce in your slow cooker. Which means you can prepare the meatballs ahead of time, and then refrigerate or freeze them for a later meal (or appetizer!). Perfect for game day OR dinner — these Asian maple sausage meatballs can be served as is for a delicious appetizer that hungry fans will gobble up, or they’re also an easy weeknight dinner served over some coconut milk rice! Easy, delicious, and versatile — how can you go wrong? Oh, wait… I forgot to mention that they’re inexpensive, too! Thanks to using budget-friendly pork sausage, which is pretty versatile in and of itself. It easily replaces ground beef in almost all of your favorite recipes, adding a little extra flavor boost in the process. We often use it in our spaghetti meat sauce for a change of pace. Needless to say my starving teenagers (can you hear my sarcasm coming through?) gobbled these meatballs up. They were literally jostling each other out of the way to try to find the biggest ones… But the joke’s on them! I used my trusty small cookie scoop to ensure they were all uniform in size. One batch makes about 24 meatballs — so I doubled it for my BIG EATERS. I did find that the sauce was plentiful enough that it didn’t need doubled. Though, if you’re taking these to an event where they’ll be cooking for awhile, I’d recommend increasing it, as it will surely thicken up more the longer it cooks. PIN IT NOW! CLICK HERE TO ADD THIS ASIAN MAPLE SAUSAGE MEATBALLS RECIPE TO YOUR EASY RECIPES BOARD ON PINTEREST! With only 6 ingredients, these Asian maple sausage meatballs are easy to make and a total crowd pleaser… Finished in the slow cooker, they perform double duty as a game day appetizer or as an easy weeknight dinner when served over coconut milk rice! Preheat oven to 400 degrees. Cover a baking sheet with aluminum foil. Place all of the meatball ingredients in a large mixing bowl. Work together until fully combined, but do not overwork the meat or the meatballs will be tough and dense. Portion out meatballs using a small cookie scoop, shape into balls, and place onto prepared baking sheet. Bake at 400 degrees until browned and cooked through, about 20-25 minutes. Add all of the sauce ingredients to your crockpot and stir together. Turn heat to low and add the cooked meatballs. Heat for 30 minutes and turn the crockpot to warm before serving. These meatballs are amazing served as is for an appetizer, or serve over coconut milk rice for an easy weeknight dinner. Besides the FOOD(!!! ), my favorite aspect of the Ohio Pork Luncheon was the opportunity to talk one-on-one with real life Ohio pork farmers, like Tom Graham of Oaklawn Farms. I learned that pork farming has changed dramatically over the last 30 years and that it takes only 6 months for a pig to reach its go-to-market weight of 270 pounds. It was eye-opening to hear that pork farmers have NEVER used hormones to bulk up their pigs (what an ugly rumor!) and that everyone entering the pig barns has to “shower in and shower out” to protect the pigs from outside contamination. Like they literally must take a shower and completely change clothes every single time they enter and exit the barn — wow! The pride and passion and dedication these individuals show for their pigs is truly inspiring, and I’m thankful for their commitment to raising “happy, healthy pigs, which make for good food”. Because I LOVE me some bacon — but I love my family even more, so being educated about the food I choose to feed them is always a good thing! These meatballs looks amazing, and I can hardly wait to make some. For sure it’s added to my dinner dish to make. Thanks for sharing. I just joined THS site, and I am loving it. Happy to have you, Ivory — hope you adore these meatballs, too! I made these meatballs last evening and they were delicious! My husband’s comment was: “These are really good, maybe too good! !” I also had my granddaughter over who is so picky; she won’t eat anything. She also loved the meatballs. I also must comment on how fast and easy they were to mix together. They were in the oven very quickly, which is a recipe that I like. I just served a fruit salad with the meatballs because we are watching our weight, but you can do anything with them. I doubled the recipe and I had lots of sauce left over. As expensive as the syrup is, the next time I will just stick with one recipe of the sauce. I think this will be just fine. I warmed them in my slow cooker and used a crockpot liner. They were very easy to mix up in the sauce because I just lifted out the meatballs and the liner and shook them around to make sure every meatball had sauce.